Place butternut squash, onion, garlic and bacon onto the prepared baking sheet. Season with Three Kings to taste. Spray or toss with olive oil. Bake for 25-30 minutes, or until squash is tender. Meanwhile, heat a dutch oven over medium high heat. Add remaining diced bacon and cook until crisp, about 6-8 minutes. Transfer to a paper towel lined plate. Drain all but 1 tablespoon of bacon fat. Reduce heat to medium. Add baked squash mixture to dutch oven. Season with thyme and Three Kings. Cook until fragrant, about 1-2 minutes. Stir in chicken stock. Puree with an immersion blender. Bring soup mixture to a boil. Simmer until thickened, about 5 minutes. 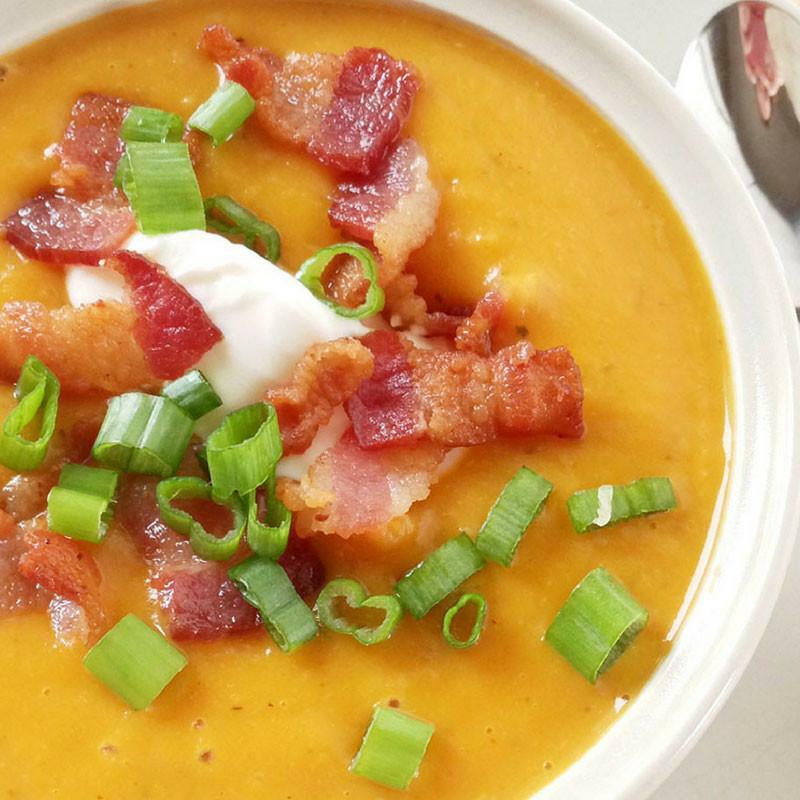 Serve immediately, garnished with cooked bacon, sour cream, and green onion. Enjoy! Why it works: Maple sugar, hickory smoke, and habanero powder in Three Kings work together to perfectly compliment the sweetness of the butternut squash and the smokiness of the bacon.